Chase has to Restart his life because he fell off his roof. 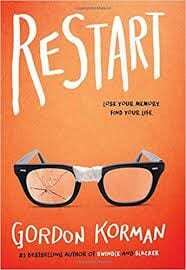 This book tells you about a boy that has to restart his life. I love this book because Chase was a bully but then he just turned into a normal person. TEN OUT OF TEN. think has the greatest impact on Chase’s character? This book makes such a wonderful case for the need we all have to reinvent at least parts of ourselves sometimes. Its message of redemption and second chances is awesome!